Gravel is a very versatile choice for your landscaping design plans and there are many reasons to consider it for your garden: that lovely crunching sound it makes underfoot, the modest cost compared to most hardscape materials, the bonus of preventing erosion and water runoff, and simply that it looks great in almost any style you choose. Maybe the only hindrance to using gravel is that the large range of colors, sizes, types and textures make for a hard decision. To simplify the process, let’s review details that may help with your choice of gravel. Before you pick out something based solely on its looks, your landscaping design should consider where you’d like to use it in your yard and how you’d like the material to behave. Some gravels (like pea gravel) “roll” underfoot, while others compact to form a more stable surface, making it easier to roll a stroller or wheelchair across a gravel patio. Also if you will be mixing textures, for example stepping stones filled in with smaller material, certain options like decomposed granite will be less likely to work up onto the pavers. The various forms of gravel will have a wide range of pricing depending on the type of rock and the size of the stone. You will find an impressive cost saving by using local gravel, one that is commonly available in your area. You are saving by not having to pay for the cost of it being trucked in from another region. Typically gravel comes pre-packaged in a bag (or you can fill your own bag at a landscape supply store) or it comes in bulk and is sold by the ton or cubic yard. Will you need to plan for wheels? If your application site will be having regular wheeled traffic you need to make sure the foundation area has been properly compacted to reduce any ground shifting. This includes areas designated to be used as driveways, patios and paths where wheelbarrows, bikes, strollers, wheel chairs and also walkers will be used. 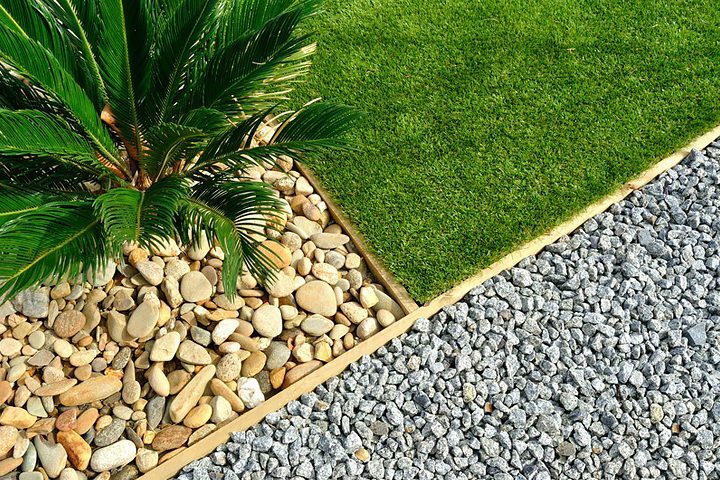 In these circumstances, wheel friendly choices would include very fine decomposed granite or a crushed rock with flat edges that lock in place. It will also help to tamp down materials between layers or use binding product that will help keep the fine stones in place. A professional landscaping design company will have the equipment you need to properly compact or “tamp” the area for you. Will you be mixing gravel and pavers? Combining the texture of large pavers and small gravel can make a beautiful addition to your yard; however, you will need to choose compatible elements. First consider color so that pavers and gravel complement each other. Then think about the size/texture and use one that reduces the chances of it traveling up onto the larger stones’ surface. Chunky stones have the advantage of weight and gravity will be more likely to hold them in place. If you prefer smaller gravel opt for a crushed product that will more readily lock into place. Is tracking things into the house a concern? Small gravel that sticks in shoe treads can cause scratching on hardwood floors or become lodged into carpets. If you have concerns, conduct a simple shoe test: Check out the size of treads on the sole of your shoe. Any product smaller than the tread can be tracked into you home. Large particle choices like drain rock are less likely to be a concern for tracking, but don’t let that deter you from including decomposed granite or pea gravel in your landscaping design. You can always use a binding product to help hold the small stone in place. You will want to choose some that works well with any other hardscape elements in your yard, including wood, stone or brick. Also think about the ambience you are trying to create. Warm-tone products can provide a compatible backdrop for lush foliage. Brown tones will add a rustic, earthy feel. On the other hand, cool tones like those made of crushed slate add a powerful contrast to bright greens and pale flowers and give a soothing contemporary look to the landscape. Will this be your main ground cover? If you have drainage issues or a low water garden, you should pick some that doesn’t compact. Pea gravel will work in this instance and offers the option of easy digging if you want to add a new plant. Standard drainage gravel is about 1″ in size and comes in white or tan. It will have an industrial look. If you prefer a more soothing appearance, a 1” smooth or tumbled stone may be the answer. You can also use a crushed rock just be sure it does not have a stabilizer added. This review of considerations should point you in the right direction to make good choices for your landscaping design. If you need further assistance, consider using a North Texas landscape design professional to help with best options and installation. Now that you are versed in gravel products you can have a good conversation about you wants and needs.